Local author Byrd Baylor wrote Yes is Better than No as a collection of stories, some previously published in periodicals in 1977. As a resident of the Southwest, Baylor wrote of the region once known as Pimeria Alta, which is now Southern Arizona and Northern Sonora. This signed copy offers an insight into the private world of the Papago Indians and their culture. In 1979 Dana S. Lamb released Beneath the Rising Mist. Bookmans Speedway currently has this signed 1st edition Stonewall Press copy illustrated by Tom Hennessey for $125. Lamb is the top lyric fly fishing writer of his time. Lamb spins a poetic tale of the thrill of outsmarting his quarry, fishing’s beauty, magic, triumphs and tragedies. The extremely well known work The Voice of the Desert subtitled A Naturalist’s Interpretation was written by Joseph Wood Krutch in 1954. Bookmans Speedway acquired a signed 1st edition copy of a tale of a city-bred scholar who settles in Tucson. Krutch writes of discovering the desert wonders and finding himself exactly where he is happiest. The masterful work explores the creatures, their habits and the essence of the desert that he comes to call home. 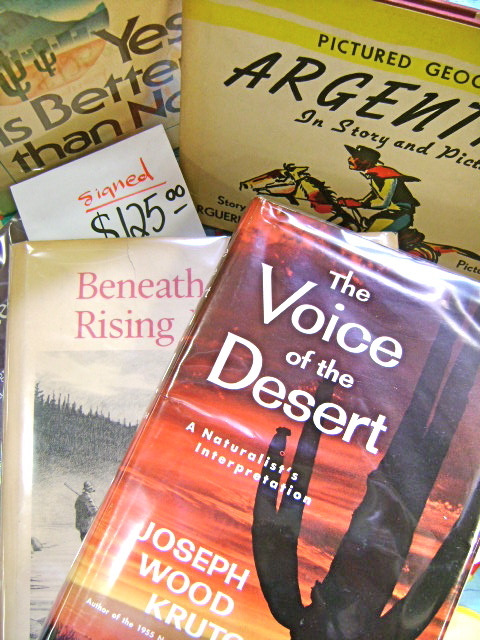 Bookmans Speedway has a wonderful collection of novels both fiction and nonfiction, local interest and from around the world. Whatever your tastes, no matter what special find you are looking for, Bookmans Speedway always delights!